Full Size Folding and Non-Folding Metal and Wooden Cribs for Commercial Use in Hotels and Resorts, Daycares and more - Consumers can also purchase these Products. These Cribs are convenient from a storage and set up standpoint for Hotels and Resorts yet offer parents with the comfort of providing a solid crib for sleeping children. 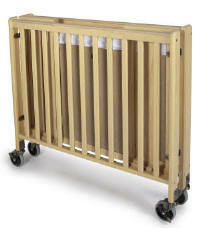 Our crib line is also available for Daycares, Hospitals and Children's Nursery Centers as well as in home use. See Price List or individual descriptions for Cribs available in the US and Canada. Cribs include mattress as indicated. 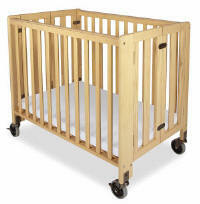 PLEASE NOTE THAT WE NO LONGER SELL DROP SIDE CRIBS IN CANADA. While the new regulations are not yet in place in Canada - we have taken a pro-active stance on this issue. THESE CRIBS ARE AVAILABLE FOR CANADIAN CUSTOMERS ONLY. 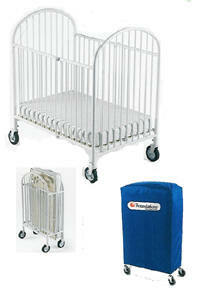 Click here for Compact Size Metal and Wood Folding and Non-Folding Cribs. Crib Size: 54" X 30.4" X 34.25H"
The Hideaway blends convenience, durability and great design will offering a more home-like feel than traditional folding cribs. Innovative folding design enables folding without disassembling and provides storage for mattress in folding position. May not fit through all doors in the open position. 4" commercial, non-marking casters - 2 locking. Sleeping surface of 28" x 52" and comes with a 3" thick high density foam mattress. Side rails feature durable, non-toxic plastic teething rails that are easy to sanitize and prevent teething on wood surfaces. All hardware is color coordinated to present a more attractive appearance. Very compact in folded position requiring minimal storage space. Hardwood construction and heavy duty hardware for years of reliable use. Constructed of heavy-duty steel utilizing a 360 degree welding process to provide long-lasting strength. The non-porous, easy to clean, powder coated finish resists corrosion and scratches. Features reinforced locking floorboards and oversized locking casters made of non-marking material for easy transport over any surface. A Professional Series� ultra durable antimicrobial mattress provides superior comfort and is included with every innacle� crib. Cribs arrive fully assembled and can fold flat in seconds for easy storage. Full one year warranty. Crib meets CSPC, ASTM and JPMA crib safety standards. Canadian Version meets new Canadian Standards. Mattress Not included - Optional 4" or 5" foam mattress or 5" Spring Mattress. 4" Casters. For Canadian customers. All instructions are permanently affixed to avoid loss, and are printed in English/French for Canada. Crib Size: 55" X 39" X 43"
full size sleeping surface - 28" x 52"
Instructions are printed in English and Spanish and are permanently affixed to avoid loss. Fully assembled and can fold flat in seconds. These products only available in Canada. Discounts for multiple orders. Contact us for customized service. These Products are Shipped by Freight Forwarder. Hotel And Leisure Living Services Ltd., under the Hotel Fun 4 Kids� Program is committed to improving the quality, accessibility and safety of cribs used for children in Hotels and Daycare Environments.